Harikesanallur Muthiah Bagavathar (1877 – 1945) was a 20th century carnatic music composer, and a ra’ga creator. Let us call him HMB for ease from now on. HMB learnt from Padinaindumandapa Sambasiva Iyer for 9 years and made his name as a Harikata Vidhwan. (harikatha is an art of story telling infused with music) He was also adept at playing the chitra veena and mridangam. He had to his credit almost 400 musical compositions, the largest among the post-Trinity composers, that included many different types of Varnams as well as Kritis and Thillanas. His inventions included ragas such as Vijaysaraswathi, Karnaranjani, Mohana Kalyani, Niroshta, in which the trademark songs were “charanam vijaya saraswathi”, “vanchathonuna”, “bhuvaneshwaria”, “raja raja radhite”. 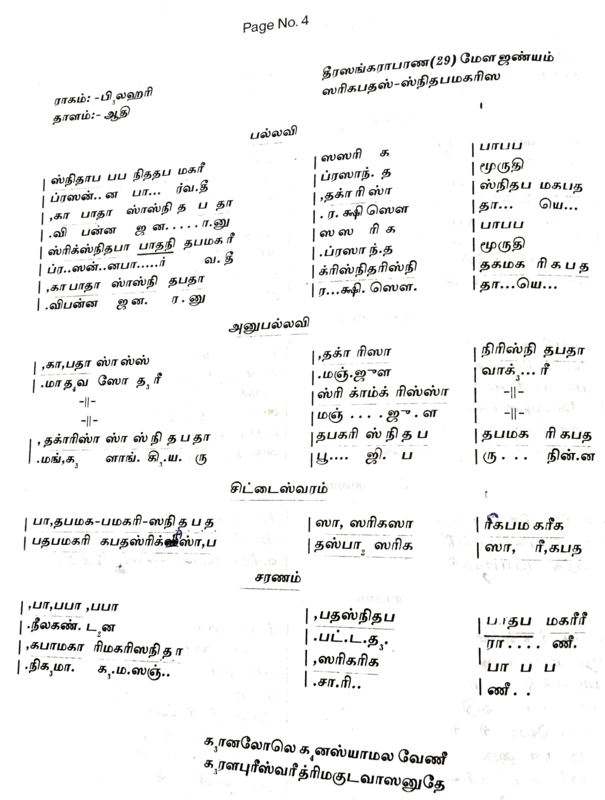 The famous English notes made popular by Madurai Mani Iyer was actually written by HMB himself. Though the Trinity composed many nottuswarams in their period, this is the one that first comes to our mind. Until the invention of Niroshta, all the audava ragas (with notes per scale) had at least PA or MA in its grammer. This raga is sans PA and MA, the only two swaras which are pronounced by closed lips (bilabial). Leave it to the genius of HMB to also compose a song whose lyrics are devoid of bilabial sounds. Listen to… TN Seshagopalan singing mathe malayadhwaja, a dharu varnam in raga Khamas. A speciality in the last chitta swaram of this varnam is it is fully a swaraksharam (same syllables denote swara and lyric) praising the Goddess. Also to be noted is that TNS was the disciple of Sankara Sivam, who in turn was the disciple of HNB. Disciples include Sankara Sivam (as mentioned above), Madurai Mani Iyer. HNB also opened a music school called the Tyagaraja Sangita Vidyalaya in Madurai in 1920 on the lines of a gurukulam. Gudalur Narayanaswamy Balasubramaniam (1910 – 1965), popularly known as GNB, was a vocalist in the Carnatic tradition. He did diploma in music with Madras University (first batch) where Tiger Varachari was the principal. He gave his first concert in 1928. He was also a tamizh movie actor and performer, but we are concerned about the composer here, aren’t we. His unique style, regulated tempo and masterly delivery were the delights of performances. His mellifluous voice would traverse the three octaves and the three speeds with ease. His brugas were infectious and he kept his ears and mind open to receive what was best in other musicians. This style probably reflected in his compositions too. Listen to… Sikkil Gurucharan sing unnadiye gathi in raga bahudari. My memory and stealthy concert recordings reminded me of this song 😉 Though this video is just a sample, it has almost until charanam, so enjoy listening. He had many students, most of them popular in the Carnatic Music industry, such as M. L. Vasanthakumari, Radha Jayalakshmi, Tanjore S. Kalyanaraman, Trichur V. Ramachandran, M. S. Subbulakshmi, T. Balu. On a parting note, I would like to leave a line from an article on GNB: “…did not agree with those who maintained that the last in composing had been done by the Trinity and that it was a sheer waste of time to attempt to produce anything that may be greater than the works of those three great masters.” I agree. I’m not sure if everyone will accept my choice of composer with F – I am going to write about my Father, Sri S. Devanathan. Appa is mostly a self – learnt musician, through concerts and cassettes. There were times when his rendition of songs would be exactly like Maharajapuram Santhanam, his maanaseega guru. He has taken formal training from OS Thyagarajan and TN Seshagopalan, in the later years. Appa has written over 70 plus songs in Tamizh, most of them on specific gods and goddesses as and when he visits the temple. He started using the mudhra Devan in his later songs. My first memory of Appa composing was when we had been to Namakkal temples and that night after we were back home, Appa had written a song on Namakkal Narasimhar in Desh, . Listen to… Appa sing a song written on Muthuswamy Dikshitar and rendered by himself in raga Reethigowla. Kallidaikurichi Dr. ES Sankaranarayana Iyer (1881 – 1947) was a medicine man and a carnatic music composer. A large part of propagating his works was done by the Maragatham Sankaranarayana Trust. They conducted annual concerts of exclusive ESS Iyer compositions by various eminent musicians. The recordings are held by the trust and you can contact and them here. When the top sabhas hold competitions about ESS Iyer, the trust helps by giving cassettes to prepare. The winners of the competion are invited to the trust’s annual concert, and their Guru is given a ‘Bodhaka’ award (probably one of the very few proud moments I could make happen to my father, who taught me these songs). There are over 150 songs written by him, in languages Tamil, Telugu and Sanskrit. I am going to list down the ones I know, here. It is said that after his demise, few (balance) of his compositions were set to tune by family members. My all time favourite Behag composition is Kamaladhala kannan, which is about the lady describing to her thozhi, how much she misses Kannan. There are no videos or audio tracks of ESS Iyer’s compositions available online, I’m not sure if it is due to copyright issues. I wanted to post Sanjay Subramaniam singing Behag from the cassette, but in vain. Nevertheless, I can give the lyrics here. Tirumakudalu Chowdiah (1895 – 1967) was a Carnatic classical violinist and he has also composed a handful of songs. He was of Kannada origin and thus his compositions were in Kannada. He was home schooled by his violinist uncle initially and then he learnt from Sri Bidaram Krishnappa. Chowdiah devised a unique method of enhancing the sound of the violin. He crafted a violin with seven strings. What the additional strings did was to resonate along with the string being played upon. This gave the Carnatic violin a greater volume in sound. He also developed a technique of playing it. The Chowdiah Memorial Hall was constructed in memory of the violin maestro Chowdiah. It is located in Bengaluru and provides a home for musical and theatrical performances as well as competitions. The auditorium is built in the shape of a gigantic seven stringed violin, complete with the strings, keys, the bridge and the bow. He used the Mudhra trimakuta after his birthplace (the T in T. Chowdiah). I learnt these songs from the notations given in the tamil transliterated book of Chowdiah’s compositions. Hence I am presenting here one such kriti’s notations – prasanna parvathi, in Bilahari. The crisp chittaswaram is something to be noted. Listen to… Chowdiah playing the said composition in Bilahari. I am assuming this is the 7 string violin as it sounds different from the regular violin carnatic solos I have heard. Carnatic musician, violinist, veena player, playback singer, actor Mangalampalli Balamurali Krishna (1930 – 2016) is a multi-faceted genius, but this post is only about the composer in him. The young Balamurali Krishna started his music training under his father Pattabiramayya. Then he went to learn from Parupalli Ramakrishna Pantulu and took music full time from the age of 15. Apart from composing varnams, thillanas, krithis in languages including Sanskrit, tamil and Telugu, Sri Balamurali also invented ragas and thalas, and also composed songs in them. Some of his ragas had the most unconventional combination of only 4 (Mahathi, Lavangi) or 3 (Trisakthi) swaras in the raga, when the traditional ragas had 7 / 6 / 5 swara scale at least. He has to his credit, over 400 compositions; he has composed in every melakartha raga; and I would like to list a few interesting compositions here. I think a musician will be able to do a full fledged concert just with a set of songs like the above list. Since I said this post is about Balamurali’s composing skills, let’s not leave out film music composing. He has got a national award as best music director for the film Madhvacharya (1986). Listen to… Nookala Chinna Satyanarayana singing Balamurali’s composition ‘Bruhadeeshwara Mahadeva’ in ragam Kaanada. The interesting thing is Balamurali himself is playing the viola for this particular concert / recording. As an ending note, I wanted to highlight this. Balamurali was once asked what he cherished most about his life. He replied, “it was the pleasure of seeing his compositions sung by others in his lifetime, an honour that was not given to the great composers of yore, such as Thyagaraja or Purandara Dasar.” That was the essence of the man, proud and happy. To those who don’t know the significance of yesterday’s post on Ambi Dikshitar, yes, it is the start of a series of posts, for which I am doing the ‘theme reveal’ below. The last few years I have been watching my fellow CBC blogger friends do the AtoZchallenge in various interesting themes. Though I have been wanting to participate all the while, I really couldn’t muster as much time and effort to get it started all these years, let alone complete it. The closest I came to doing an A to Z challenge was writing a series on Ragas – believe me, it was one per alphabet, though I did not propagate it then. And I did not follow the timeline either. I have finally started writing for this year’s AtoZ blogging challenge 2017; now that I have successfully posted for the first alphabet (A for Ambi Dikshitar), I can reveal my theme. As you might have guessed, I am trying to write about Carnatic Music Composers / Vaggeyakaras. The emphasis will be on vaggeyakaras (the same person writes lyrics and tune for songs). I am not taking up well known names like Trinity or Papanasam Sivan. I think this will be a good opportunity for me to read on and learn more about not so well known composers. I hope I go all the way till Z successfully. Wish me luck! Muthuswamy Dikshitar’s adopted son, Subbarama Dikshitar named his son also as Muthuswamy Dikshitar, after his father and revered composer. The kid later came to be popularly known as Ambi Dikshitar (1863-1936), in the same lineage. Sri Venkatesam Bhajami in Kalyana Vasantham in the voice of Maharajapuram Santhanam who made this song popular by singing it in many of his concerts. Though I haven’t listened to one in person, I remember the cassette recordings and my dad’s splitting reproduction of this song, as I grew up. The YouTube video title is ambiguous and says Muthuswamy Dikshitar, but sources confirm this is an Ambi Dikshitar composition. Ambi Dikshitar initiated the music learning of DK Pattamal, S Rajam, Ananthakrishna Iyer, to name a few. He and his disciples made it their life mission to preserve and propagate Muthuswamy Dikshitar kritis in their pristine purity. The Dikshitar lineage was followed by Ambi’s son Baluswami Dikshitar.